Why to learn Spanish? Which advantages have to learn Spanish over other languages? When some student decided to learn Spanish as a second or third language, many questions come to his mind. Almost every question is connected to the functionality of the language in studies or in a professional career. Sometimes these questions are related to entertainment or cultural preferences. There are some many reasons to learn Spanish, some of them have to be with family relationships or with enjoy specially Spanish and Latin-American culture. We have found five reasons that can help you to choose for our language. More than 500 million people speak Spanish around the world. Spanish language is official on 21 countries and is 16, 4% American population mother tongue. Spanish is the second language in the world in number of native speakers after Mandarin Chinese. Also is the second language on international communications. 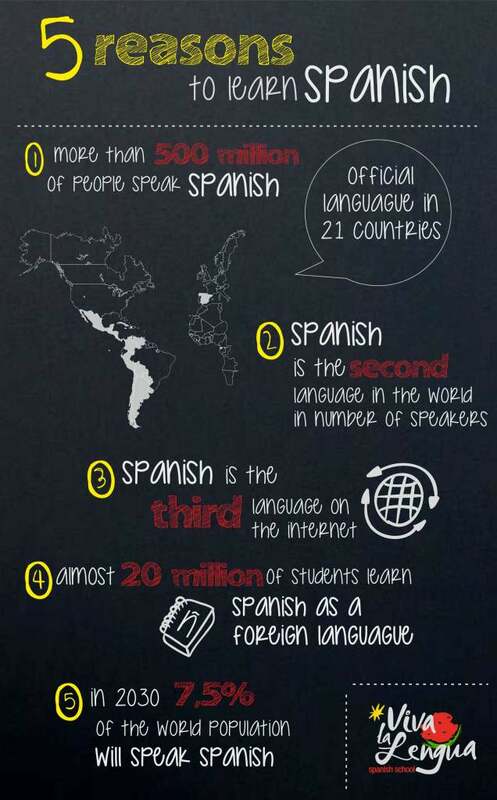 Spanish is the third language on the internet, 7, 8% of the internet users have connection in Spanish. For that reason, it is possible to find a great content in this language. In 2030 el 7, 5% of the world population will speak Spanish. That means 535 million people as a result of the Spanish-speaking growth population in United States and Latin-American countries. 1) It comes in handy if you are working and there is a customer who can only speak Spanish. You could understand and help the customer with what they need. 2) If you travel to countries that use the Spanish language, you can communicate with people to get directions, or find the best tourists sights, places to get food, etc. 3) Learning a second language can open doors, and can help you have more job opportunities. 4) Learning a second language can create friendships that you might not would have, if you only knew one language. 5) If someone came to america and didn’t know enough English to get by, you could be able to translate and teach them English. 1) Es útil si usted está trabajando y hay un cliente que sólo puede hablar español. Usted podría entender y ayudar al cliente con lo que necesitan. 2) Si viaja a países que utilizan el idioma español, puede comunicarse con la gente para obtener direcciones, o encontrar los mejores lugares para turistas, lugares para conseguir comida, (etcétera). 3) Aprender un segundo idioma puede abrir puertas, y puede ayudarle a tener más oportunidades de trabajo. 4) El aprendizaje de un segundo idioma puede crear amistades que usted no podría tener, si sólo sabía un idioma. 5) Si alguien vino a america y no sabía bastante inglés para conseguir cerca, usted podría traducir y enseñarlos inglés.